We’ve developed and then released to the world our own open source content management system. It’s free to use, for anyone (you and/or other agencies). Should you ever decide to move to another agency, the site and all code is given to you. You own it, it’s yours. Free, open source content management system. We’re flexible and capable of working with a content management system that you’ve chosen, below are some examples of systems we have experience with. If the CMS that you’ve chosen isn’t below, fear not, just contact us and we’ll more than likely be able to help you. Click the link to see our portfolio of content managed webdesign. 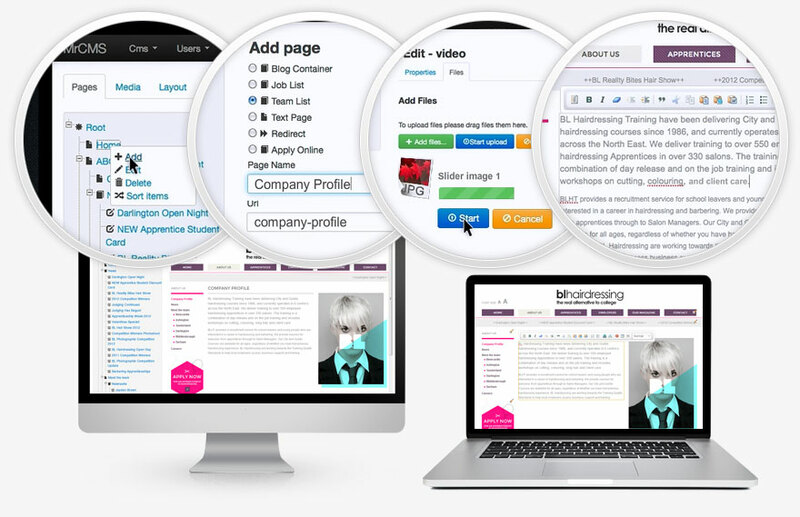 If nothing fits your requirements we also build 100% bespoke websites & CMS. Tailored to your needs. Below is a small selection of websites we’ve built. These range from a small corporate websites to large scale publishing and news systems for multi-national companies. If you’d like to see more take a look at our full web-design portfolio. We know, what you really want to know. Does it do what I need & how much will it cost? We hope that the above has answered some of your questions about whether it does what you need. If not, please \\contact us. for an informal chat about your project or we can demo a store in action. We employ no ‘dedicated’ sales staff, so there’s no hard sell. We can get your website up and running with a CMS from as little as £1,500. The realistic price would depend on how much additional functionality you would need that isn't included at the base level.